Different pipelines exist for different instruments, based on their performance characteristics and how the data are to be archived. Note that some level of data reduction is available for all instruments (not just those listed below); details are given on the individual instrument webpages. If you have any questions, comments or suggestions, please don't hesitate to contact us . Basic instrumental reductions are applied to all IO:O images before the data are passed to users. This includes bias subtraction, trimming of the overscan regions, and flat fielding. A library of the current calibration frames is maintained as part of the data archive and updated daily so that images are always reduced using the latest available flat-field image. Each of the operations performed by the pipeline are described below. IO:O uses a 'dummy' read-out circuit which is identical and in parallel with the signal read-out except that it is not connected to the detector read-out register. This provides a differential reference signal to which the data signal is compared to reject common mode noise. Rather than apply the noise rejection in hardware, a 'dummy' image is stored in the raw FITS file and subtracted off by the data reduction pipeline. It thus functions effectively like a bias image taken pixel-perfect simultaneously with the image data. The differential image is linearly scaled by an empirically determined constant before subtraction in order to minimise the common mode noise in the final result. Bias subtraction is based on analysis of the overscans on either side of the image. Various options exist in the pipeline software but the simplest — a single constant bias value for the entire image — has proved to be most effective and robust because any spatial structures, ramps etc have already been removed by the differential image subtraction. When multiple read-out amplifiers are being used, a single bias level is deteremined spearately for each one. The overscan regions are trimmed off the image leaving a 2048x2056 (assuming 2x2 binning) pixel image. The overscans are not included in the reduced data products. This is not currently performed though the facility exists in the reduction pipeline if required. At operating temperature (-110C) the dark current is less than 0.002 electron / pix / second which is not significant for most purposes. If you feel you need a dark frame, please contact us. Twilight flats are automatically obtained every evening and morning. From five to seven frames are typically obtained, dithered on the sky, and a master flat created as a median stack of the frames. In the pipeline the appropriate master flat field is selected from the library to match the filter and binning configuration of the current exposure. The library actually holds reciprocal flat-fields normalised to unity because of the computational efficiency of multiplying rather than dividing; the image data are therefore multiplied by the library flat. No cosmic ray rejection or bad pixel mask is applied since it is important for users performing accurate photometry to know exactly what masking has been applied. The bad pixel masks linked below are not applied or used in any way by the pipeline but are instead made available to observers for their own use. They were generated from g',r',i',z',V twilight flat fields by flagging pixels which differ from their neighbours by more than 20%. Fringing on IO:O is always weak and only significant at all in the z' filter. We currently do not perform any automated defringing of CCD data before these are loaded into the archive. However, prepared master fringe frames created by stacking multiple deep integrations of blank fields are available below. 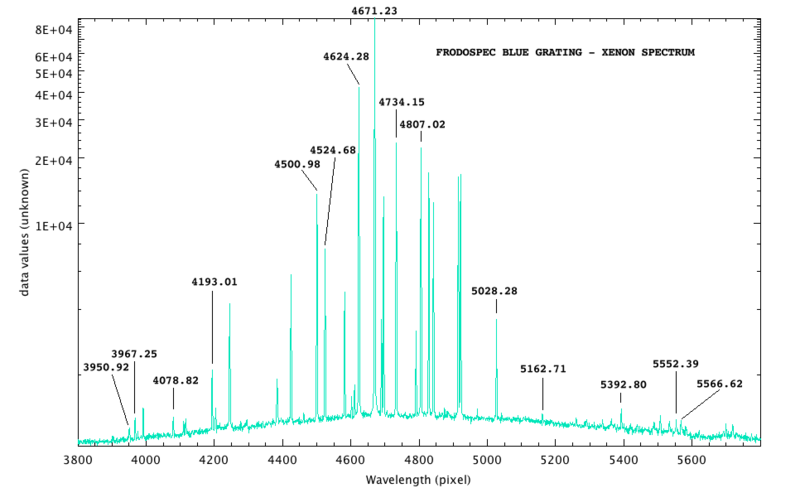 Note that the fringes on the IO:O CCD vary on timescales of months, so these data are updated infrequently. If you need access to the individual integrations used to build these master fringe frames, they are publicly available from the data archive. Simply select IOOFringe from the Proposal ID drop-down list. In this way users can extract the most recent fringe frame from the archive at any time. Fringe Frames for the previous detector were obtained 9th Feb 2012. We have not yet published fringe frames for the new e2V detector. Fringing with the e2v chip is at a very low level and can not be seen for example in individual i band frames. A slight hint of fringing can be seen in long exposure z band frames. Given the low level, until a larger data set is obtained we can not create or distribute meaningful fringe frames. Data taken with FRODOSpec are reduced by two sequentially invoked pipelines. The first pipeline, known as the L1, is a CCD processing pipeline which performs bias subtraction, overscan trimming and CCD flat fielding. The second pipeline, known as the L2, performs the processes unique to IFS reduction. The L2 became operational on 9th July 2010, with the second version released in May 2011. The description in the following sections conforms to the second version of the pipeline. Full details of the pipeline may be found in the paper Barnsley, Smith and Steele. L2 data products are eight part multi-extension FITS files with each extension containing a snapshot of the data taken at key stages in the reduction process. The lowest tier of reduction product available to the user is the L1 image. The output data product format is shown below. If the sky-subtraction process is unsuccessful, the corresponding HDUs (*_SS) will be blank. One-dimensional spectra (SPEC_*) are constructed using only the flux from the brightest five fibres. Data that has been processed successfully by both pipelines will have a filename ending in "_2.fits". The positions of the fibre profile peaks are determined and polynomial traces determined for each. Using the tramline mappings, the flux is extracted from each fibre in the target frame, continuum frame and arc frame using a 5 partial pixel aperture. Candidate lines are found in the arc RSS frame and their positions compared with a reference list containing known arc line pixel positions and corresponding wavelengths. Lines are then matched and pixel to wavelength calibrations determined for each spectrum. Using a continuum RSS frame, fibre-to-fibre throughput differences in the target RSS frame are normalised. In order to obtain a single wavelength solution applicable to all fibres, the flux from each spectrum in the target RSS frame is rebinned using linear interpolation to a linear wavelength scale with the same starting/ending wavelength positions and pixel scales. 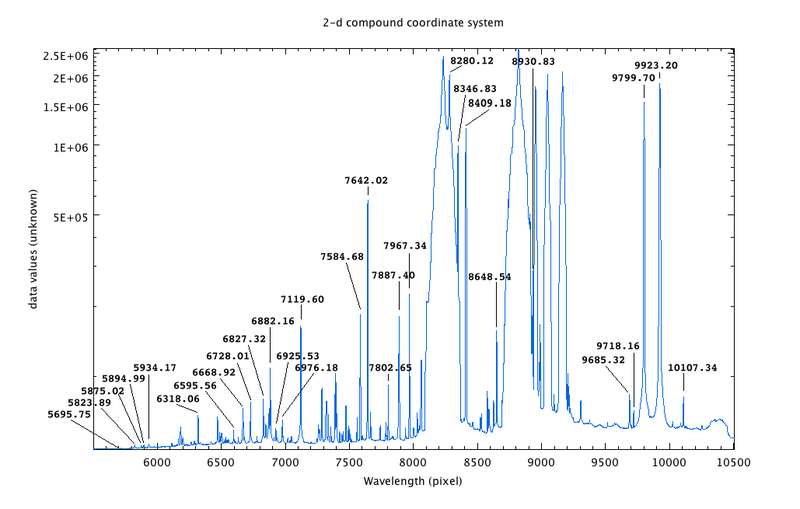 If the routine can successfully identify sky-only fibres, the sky flux contribution is removed for all spectra in the target RSS frame. In short, the pipeline first totals the flux through each fibre to construct a complete dataset of fibres fluxes. This dataset is filtered to remove "target" fibres (those it identifies as containing target flux) by an iterative sigma clip. This proceeds until no more target fibres are identified, resulting in the aggregation of a "sky-only" fibre dataset. This sky-only dataset is then compared to the complete dataset, checking to see if i) that the complete dataset has not been entirely identified as sky, and ii) that the mean of the sky-only dataset is within a certain percentile of the complete dataset. The latter is a constraint to sift out extended sources. More on this can be found in the paper linked above. A data product with the output format shown above is constructed. Starlink users may extract the appropriate extension using the CONVERT:FITS2NDF command, appending the filename with the extension they wish to extract in brackets. The result is a single extension .SDF file. Use of the lamps is not compulsory, but it is recommended because at present we do not know the long-term stability of the FRODOspec system. We therefore recommend a Xenon arc exposure is obtained every time the gratings are moved. Although simultaneous observations of science or arcs in both red & blue arms are possible, it is NOT possible to take an arc in one arm while obtaining science data in the other. This is governed by the robotic control system, which if necessary will wait for science observing to finish in one arm before beginning an arc calibration in the other. This must be borne in mind both when calculating telescope time in phase 1 proposals and when scheduling observations in the phase 2. All FRODOSpec data are flat-fielded and a sky-subtracted spectrum is created by the pipeline (and included in the reduced multi-extension FITS file) as described above. However, at the present time we do not apply any sort of flux calibration or telluric correction to pipeline-processed data. 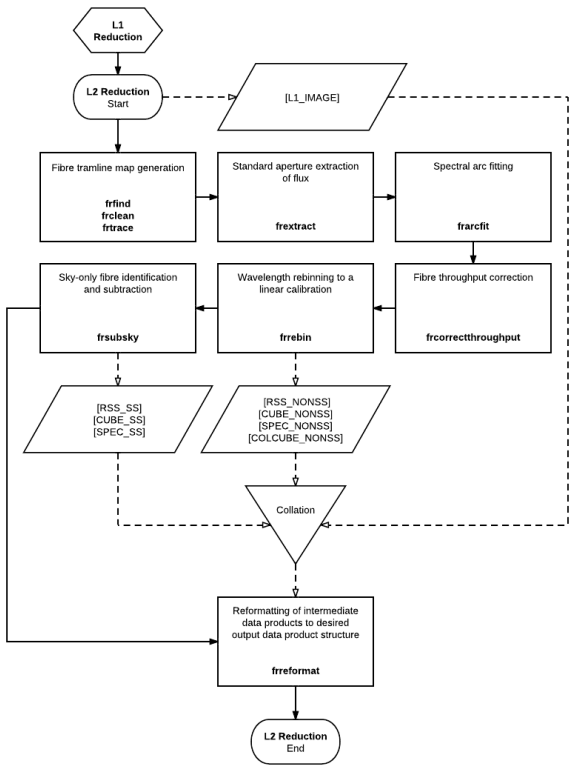 Users may therefore wish to add a standard star observation to their FRODOSpec observing sequence so that their calibration observations are matched in time and airmass with the science data; see the SPRAT Phase2 guidelines for details on how to do this using the Sequence Builder; the sequence of observations and configurations would be essentially the same for the two instruments. Links to tables of spectro-photometric standard stars are provided by ESO here. All RISE data are run through a modified version of the IO:O data pipeline on the morning after the data was taken. The pipeline debiases, removes a scaled dark frame, and flat-fields the data using a library flat which is updated every few months. The original V+R visible band filter caused no detector fringing. The near-IR filter does show weak fringing however no automated fringe subtraction is currently being applied by the pipline. An automated email is sent when reduced data are available for download. When the enclosure is open, a 10 sec exposure is taken automatically once per minute with each of the three camares. All data are automatically dark subtracted and flat-fielded and a world coordinate system fitted. Skycam-Z data remain proprietary. However, SkyCam-A and SkyCam-T data are then immediately released, both as JPEG and FITS files here. In addition both browsable (2013; 2014) and searchable image archives are available.